Did you know that only 45 percent of all employees in the United States are happy with their jobs? According to the Conference Board, that’s the lowest level of employee satisfaction in more than two decades. That also means tens of millions of frustrated workers are quietly biding their time until they find greener pastures elsewhere. o. Some people feel underpaid, under-appreciated and overworked. o. Others despise mean supervisors or annoying co-workers. o. And many employees simply want the freedom to be their own boss. Despite widespread employee dissatisfaction, lots of people cling to dead-end jobs and stressful careers. They put up with office politics, insane deadlines, unproductive meetings and all the craziness that comes with working in corporate America – just to get a so-called “steady paycheck” with benefits. After all, most employees have mortgage or rent payments to make and kids to feed, along with credit card debt and other bills to worry about. So even though scores of employees are slaving away year after year, and not really getting ahead, they feel stuck. They’re living paycheck to paycheck. But they don’t quite know how they can leave the corporate workplace and feel financially secure. Becoming your own boss offers one answer to this dilemma. Being an entrepreneur provides disenchanted workers everywhere with a way out of the corporate world. What’s more, entrepreneurship is also a viable option for the 15 million Americans currently out of work. As I often tell people, it’s sometimes easier to find a client (as an entrepreneur) than it is to find a job (as an employee). One upside of leaving the corporate world is that you call the shots, because now you’re the boss. You also have greater personal freedom and a chance at unlimited income. That’s far better, economically, than limiting yourself to a job where your salary is always capped by how much an employer is willing or able to pay. Besides, most Americans aren’t earning enough money to get ahead anyway. In 2005, wages in the United States grew by a mere 3.1 percent. That wasn’t even enough to outpace inflation, which rose by 3.4 percent. This year, things are even worse. The Society for Human Resources Management says that wage growth in 2010 will be a paltry 1.5 percent, just a bit above the record low of 1.4 percent set in 2009. Some of you may be wondering: But what about my benefits if I leave corporate America? The truth of the matter is that both wage and benefit growth hit a historic low in 2009. Benefits for U.S. workers are being steadily eroded. Pension programs are closing. Plus, 401(k) plans with matching employer contributions are being scaled back. Health care benefits are dwindling. Employer-sponsored educational assistance is on the decline. Plus, the costs of medical benefits, disability coverage and life insurance are skyrocketing for workers nationwide. It’s gotten so bad that the American Benefits Council, which represents big companies, says the state of employee benefits is in crisis. In this era of economic uncertainty, massive downsizing, and corporate cost-cutting, it is naive and downright dangerous to rely solely on an employer for your long-term financial well being. Thankfully, you don’t have to. Would-be entrepreneurs can establish a financial safety net – by creating their own set of benefits that they can take with them anywhere they go. Few people know about new tax rules, federal policies and recently created retirement plans designed to help small business owners get rich. For example, the “solo 401(k)” plan is a retirement plan for entrepreneurs that mirrors 401(k) plans found in corporate America. But the solo 401(k) is even better, allowing you higher contribution limits and potentially more investment options, as well as flexible features such as the ability to get loans from the plan if necessary. Additionally, high-deductible Health Savings Accounts are a good, tax-efficient health care option for entrepreneurs and their families. Therefore, quitting a job doesn’t mean you have to give up numerous benefits and perks. Virtually every benefit offered by an employer can be readily duplicated – and frequently improved upon – by today’s entrepreneur acting on his or her own. 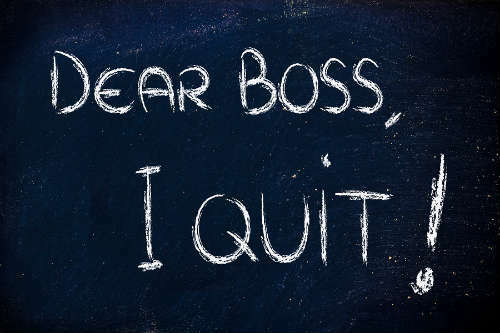 As if all that weren’t enough, here’s another reason to hand in your resignation letter: Employees today live in constant fear of their employer’s whims. Workers described as “downsizing survivors” are often racked by angst because they know that at any time any company — large or small, in any industry — can sell off divisions, or go through corporate buyouts, mergers and acquisitions. Such corporate deals almost always lead to layoffs. Lastly, U.S. workers — like others around the world — don’t like having their labor exploited. Deep in your heart, you know it’s unfair that you should do all the heavy lifting and have someone else reap all the financial rewards from that work. That’s why U.S. employees are up in arms over the issue of executive compensation. In 2009, the CEOs of the country’s largest companies earned an average of $9.25 million, the AFL-CIO reports. Most Americans find it outrageous that the average CEO of a publicly traded company earns anywhere from 300 to 500 times the average employee, especially as it’s the rank-and-file workers of America who are keeping businesses nationwide humming day in and day out. So if you’re currently in a job that isn’t paying you what you’re worth, if you’re unhappy in your present position, or if you’ve ever had the itch to be your own boss, there has never been a better time to make the leap to entrepreneurship. No more excuses. No more giving in to unfounded fears, misconceptions and naysayers. If you’re going to work 40-plus hours a week, you deserve to be happy doing so.